For Season 6’s eighth Last Chance Design Lab challenge sponsored by CND, Emily Nash and Kelsey Waldo will battle it out one-on-one to see who has a chance of staying in the competition. CND’s Jan Arnold will select her favorite look Friday and you’ll find out who will remain for at least one more week. All Last Chance challenges are done on a single nail tip. Contestants are also asked to describe their looks. There are no other elements to this battle. Since Kelsey packed her paintbrushes after Gel II’s Creative Eruption challenge, this week’s Last Chance is loosely related. Diamond in the Rough: Volcanic eruptions are known to help bring diamonds to the surface. For this challenge, use whatever mediums necessary to make a diamond on a single nail tip. I was super excited to get this challenge because Gel ll’s challenge was one I wish I got to do. So for my nail I decided to make a beautiful diamond ring emerging from lava and volcanic rock. Doing research for this challenge, I learned so much about volcanoes and diamonds and how they come about. Is actually a very violent way that diamonds are made during this process. Going down below the earth’s surface 90 miles or more, to the earth’s mantle, there are temperatures of 2000 degrees Fahrenheit. The pressure and temperature combination create volcanic eruptions that form Kimberlite and Lamproite pipes. The diamonds are then carried to the surface. These eruptions are actually very rare, however the pipes are sought after by diamond prospectors! The crazy things this earth can do and the beautiful material it can produce is just amazing. I wanted to show the beauty of the diamo, but also add the way it is made. I used hard gel to make my diamond using my e-file to carefully cut the diamond’s shape. I give kudos to diamond cutters because it’s no joke! I added iridescent pigment to just parts of the diamond to give it a sparkle reflection. The rest of the nail was sculpted out of different acrylics. Volcanic eruptions not only bring diamonds to the surface but also cause many fatalities. Many people have perished in search of diamonds. I wanted to make a diamond skull to pay tribute to all those who have lost their lives in search of these beautiful creations of nature. 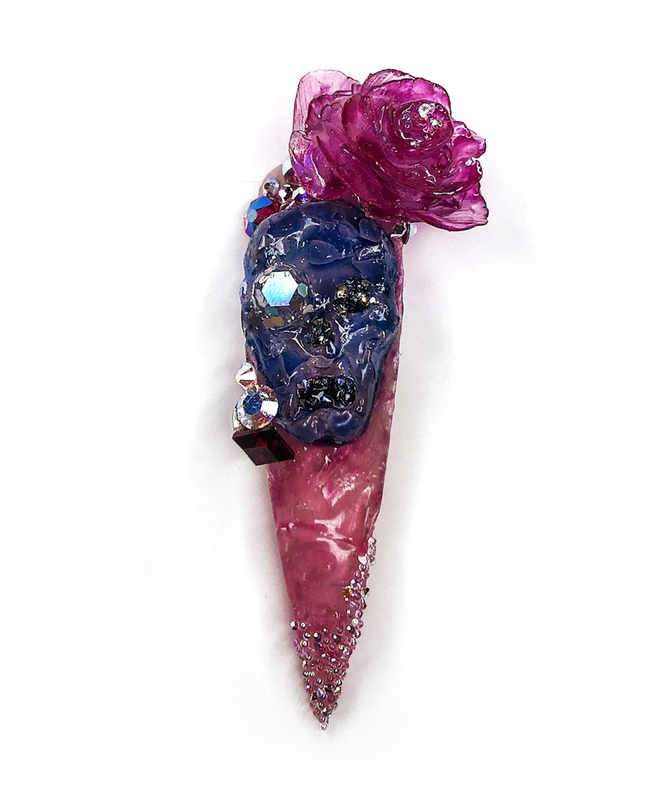 I wanted to keep with the faceted look throughout the nail, so I made the rose and nail crystallized-looking. The Swarovskis added to the overall striking diamond skull. For a final touch, the skull has a diamond in it because this goes back to the challenge’s title, “Diamond in the Rough,” because beauty is in the eye of the beholder. It is important to see beauty in all aspects of life in order for creativity to be ignited. Everything is made except for the Swarovskis. 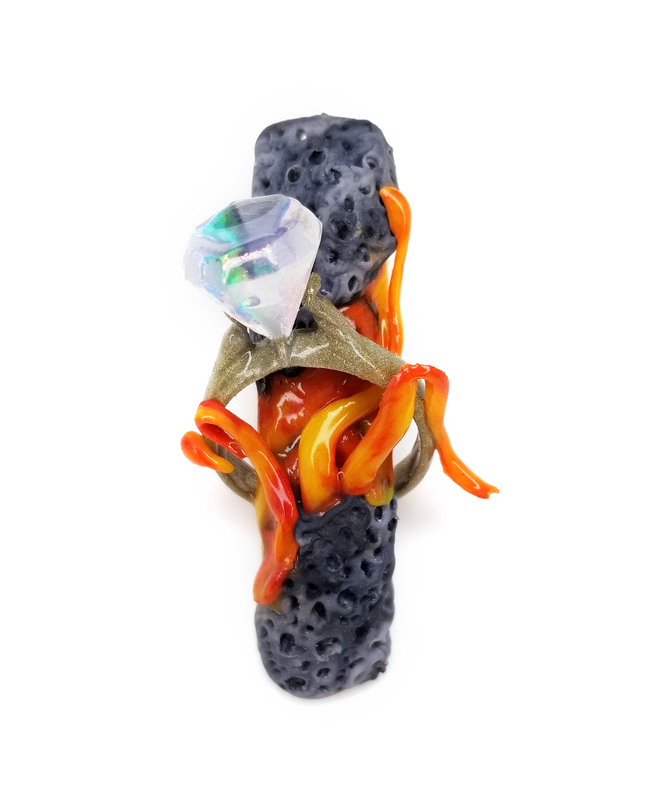 Congratulations to Kelsey Waldo for winning the eighth Last Chance Design Lab challenge of Season 6! Kelsey went up against Emily Nash to make a diamond using any mediums. CND’s Jan Arnold chose the winner. This means Kelsey will move on to compete against the next eliminated contestant. Find out tomorrow who that will be.